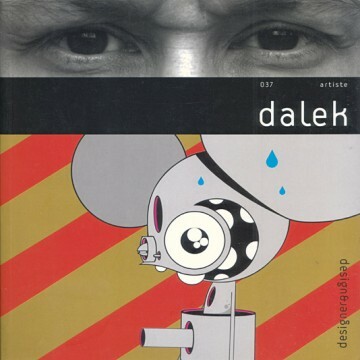 Design & Designer 037 – Dalek, official blurb: The American artist Dalek (the name on his passport is James Marshall) has in just a few years become a prominent figure on the urban graphic design stage, whose ranks feature personalities such as Miss Van, Banksy and Space Invader. Dalek started out in Brooklyn’s graffiti scene, and has built a major part of his work around his emblematic Space Monkey characters, who seem to have stepped straight out of a futuristic manga world. He started by painting walls in Brooklyn in 1994, before applying his paint to a more traditional support – canvas. His experience in 2001 alongside Takashi Murakami, a cult Japanese graphic artist, helped define his graphic way with images: flat blocks of vivid colour but ambiguous figures. His characters, though amusing at first glance, may also be perceived as disturbing hybrid beings with gaping foreheads – images of an urban world whose violence they conjure up.